Articulate Online is our hosted tracking and reporting system for e-learning content. We’ve made it easy to publish and upload your quiz to Articulate Online all at once. Go to the Home tab on the Quizmaker ribbon and click Publish. Use the Description field to give learners a synopsis of your quiz. The description will appear in the Articulate Online user portal and on information cards in the Articulate Mobile Player. 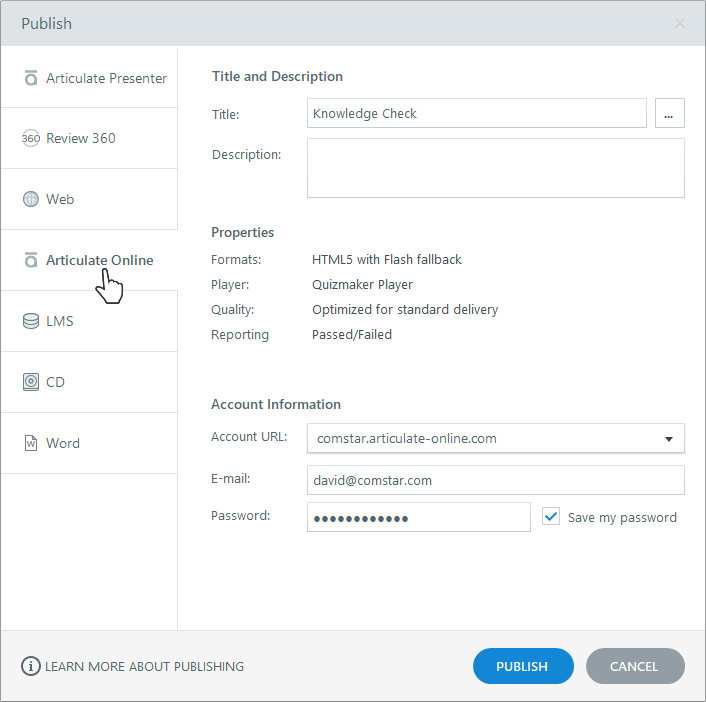 If learners use mobile devices with the free Articulate Mobile Player app, you can display additional project information in the published quiz, such as the author, duration, and version number. Click the ellipsis button (...) next to the Title field to open the Project Info window. The image below the Title field will be the quiz thumbnail in the Articulate Mobile Player library. By default, Quizmaker uses an image of the first slide in your quiz, but you can choose a different image. Just click the hyperlinked text below the image, then select a different slide or click Picture from File to choose an image on your hard drive. In Quizmaker 360, you can choose which formats are included in your published output—HTML5, Flash, and/or Articulate Mobile Player. Use the Properties section of the Publish window to make last-minute changes to your quiz player and quality settings. The Player property shows the name of the player currently assigned to your project. (The player is the interface learners see around the perimeter of your quiz.) To make adjustments to your player, click the player name to open the player editor. The Quality property lets you control the compression settings for audio clips, videos, and pictures. The quality settings default to whatever you used the last time you published a quiz. To change them, click Quality, make your adjustments, and click OK.
Mark the Optimize Audio Volume box to normalize audio throughout your quiz for consistent volume. Tip: If your quiz audio already has consistent volume, you can speed up the publishing process by unchecking this option. 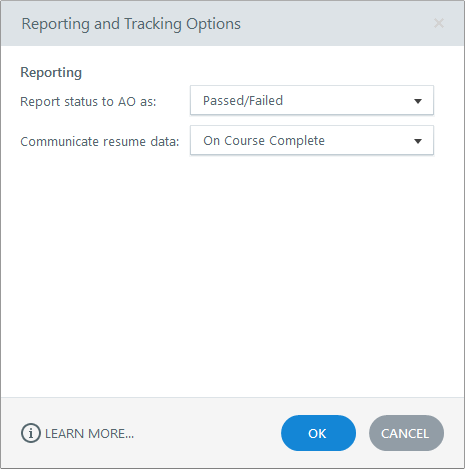 Click the Reporting property to open the following window, where you can choose how Articulate Online tracks and reports learners' progress. On Course Complete: This communicates resume data when the learner closes his browser window or when he reaches the result slide. After Every Slide: This sends resume data when the learner advances to each slide in the quiz. An added benefit of this method is that learners who experience an Internet disruption will still be able to pick up where they left off without losing their progress. Keep in mind that because this option results in frequent communication between learners and Articulate Online, it increases network traffic, which can be significant if you roll out your quiz to many learners at the same time. Your quiz publishes and uploads to Articulate Online all at once. How fast this happens depends on the size of your quiz and your internet speed. When the Publish Successful window appears, click Manage Content to open Articulate Online and manage the quiz you just uploaded. If a firewall blocks you from publishing directly to Articulate Online, you can publish your quiz on your local computer and then manually upload it to Articulate Online. See this user guide for details. Articulate Online has a maximum size limit of 500 MB per project. If you think you might be approaching that limit but aren't sure, here's how to check: publish the quiz on your local computer (see the link above) and then check the file size of the Quizmaker package that's generated. 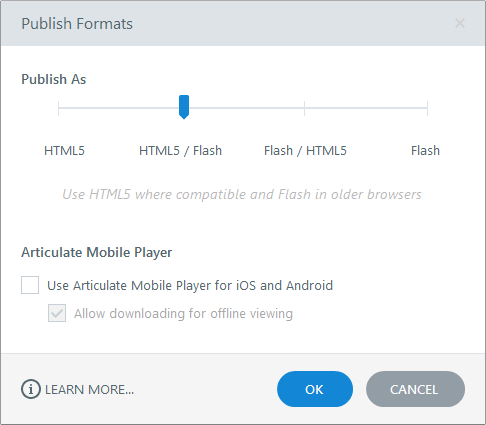 When you give learners access to your Articulate Online quiz, they'll see the right format (HTML5, Flash, or Articulate Mobile Player) based on the devices and browsers they’re using and the publish formats you included.